Apples have been falling from friends and neighbors trees to my kitchen this week, so I’m continuing Rita’s theme of apple desserts. I have a trio of favorites: Traditional Apple Pie; Autumn Apple Pie; and Raisin Bread Apple Crisp. Pie is one of the first recipes I remember making with my mom, following her favorite no-fail Betty Crocker short-cut pie crust recipe. 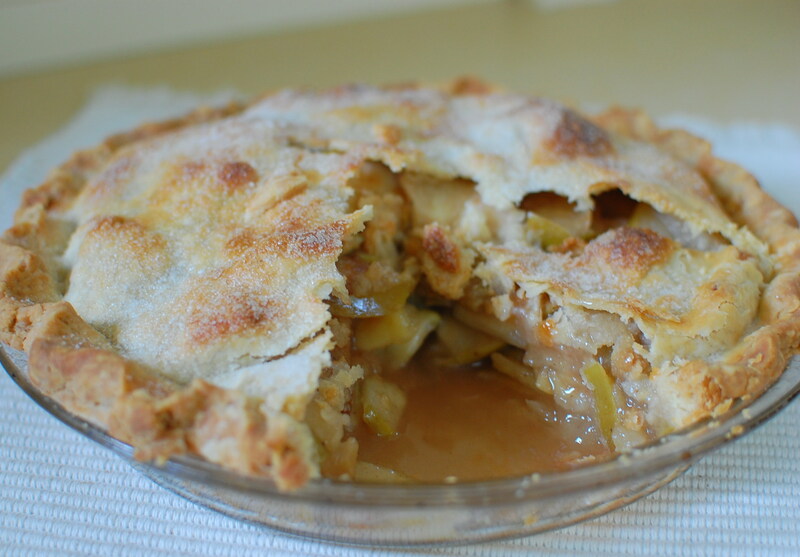 Over the years I’ve transformed many a hesitant pie baker with this easy recipe. See my step by step instructions. 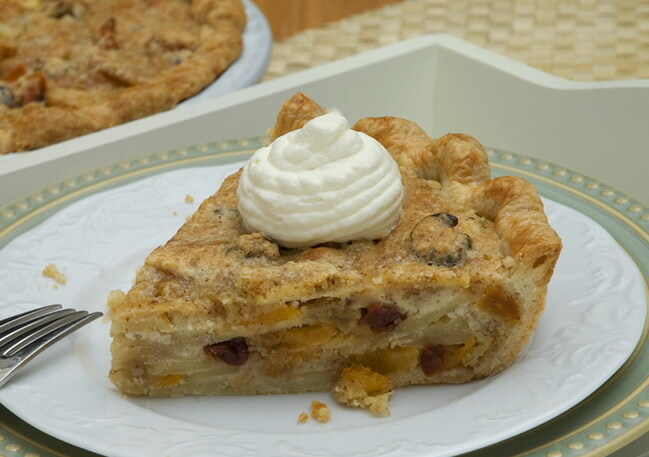 For a twist on traditional apple pie, Autumn Apple Pie is a single crust with creamy almond filling, sliced apples, dried cherries, raisins and apricots. You’ll find my recipe on the Sun-Maid website. When I’m really in a hurry, I make Raisin Bread Apple Crisp. A few slices of raisin bread plus butter, brown sugar and walnuts, turn apples to a cinnamon spiced comfort dessert in minutes. Preheat oven to 325 F. Tear or cut raisin bread into 1/2-inch pieces. Combine butter, brown sugar and walnuts in a medium bowl. Mix in bread. Serve warm, and of course with whipped cream or vanilla ice cream! Appealing — ideas you may not have thought of – hey, we all get into cooking ruts! Approachable — techniques usable in your every day cooking. Accurate — recipes for home kitchens and home cooks, who don’t have prep cooks. Achievable — results for recipes you want to make. Let us know if they work or don’t work for you! Oh Rosie, I just went on a diet and here come these delicious sounding apple pie recipes. Hope I can stop at a small piece. Dorothy – oh dear, the diet must wait! I loved using your early season Gravenstein apples. Can’t wait to try the Apple Crisp recipe. It seems so simple yet yummy. Can’t wait to try the Raisin Bread Apple Crisp–looks simply delicious!! Hi Areta – let us know how you like it. It’s a great way to use languishing slices of raisin bread — if you have any! Rosemary, I can’t get enough apples this time of year. I can’t wait to try the Autumn Apple Pie. I spoke to Rita last week about the raisin bread apple “crisp” recipe I tried. I want to try it again before I take it to Thanksgiving dinner at my sister-in-law’s. But I’m not clear on how many pieces of raisin bread to break up? My son Rich and his father both liked what I made anyway, but wanted to make sure I do it right when I make it for Thanksgiving. 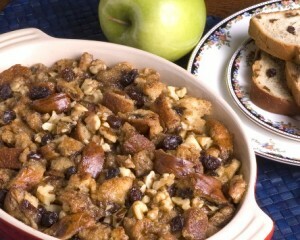 I would certainly love to make my own Raisin Bread Apple Crisp soon. Just one question aside, from walnuts what type of nuts can I use? 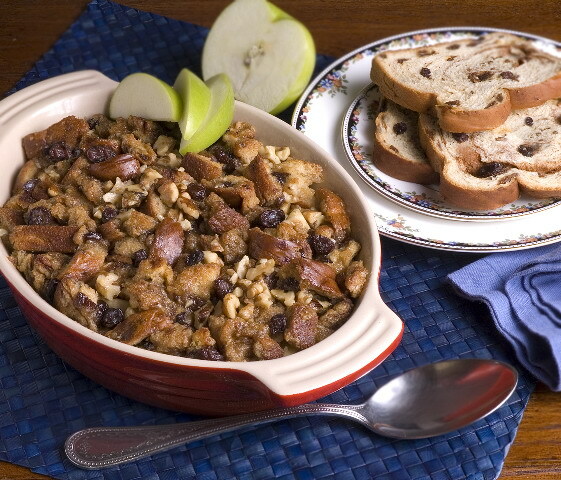 Hi Peni – Pecans or sliced almonds would be delicious in the Raisin Bread Apple Crisp. Hope you enjoy yours!